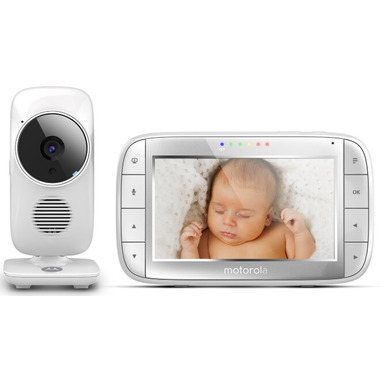 The Motorola MBP48 comes with a baby monitor and a portable 5” color LCD curved screen serving as the parent unit. 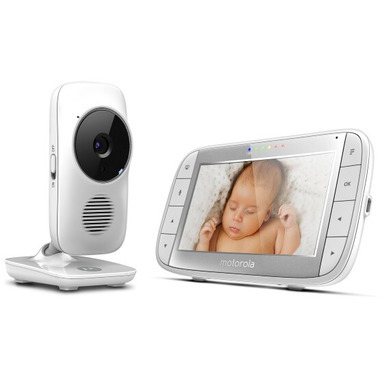 The large viewing screen makes it even better to view your baby anytime of the day, as well as at night with the infrared night vision capability. Two way audio communication is a great way to speak to your little one and be heard, while you sit back and listen to their replies in baby tongue. The MBP48 comes with pre-installed soothing lullabies to ease your baby to sleep and relax, while the handy temperature monitor lets you keep an eye on the room temperature. The MBP48 Digital Video Baby Monitor has a useful range of up to 300 metres with an out-of-range warning, allowing you to move around the house or the garden comfortably, knowing that you will hear when your little one is awake. When being used in battery mode, the screen will go blank after two minutes of inactivity, at which point the unit enters a power saving mode. Data encryption is integrated as standard for added security.